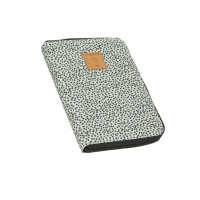 The practical document holder floral mint has a zipper, so that all of the documents, e.g. your maternity or examination records, can be securely stored. 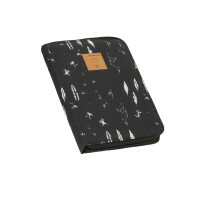 Product information "Document Pouch, Floral Mint"
description & equipment An organizational talent during and after pregnancy LÄSSIG’s Document Pouch provides space for all important documents – for both during and after pregnancy. This document holder offers enough compartments so you have everything at your finger tips – your maternity record, ultrasound images, health insurance card, examination record and vaccination card. It is also ideal as an accessory when traveling as you have everything handy – passport, tickets and vouchers. The practical document pouch has a peripheral zip-around so that all of the documents can be stored securely. 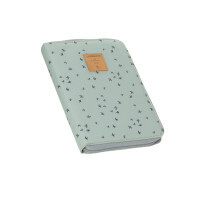 Several pockets on both inner sides (including 7 card pockets on one side and 3 notebook pockets on the other side) as well as a transparent compartment and a pen holder enable everything to be clearly organized. A zipped compartment on the back side complements the sophisticated everyday favorite that can also be used as a purse/wallet. A true all-rounder.